We’re off to Boston this evening for a belated birthday trip back home for James. We haven’t been back since Christmas, so a visit is long overdue. Since I’ve been going through the motions of preparing for the trip, I thought it would be a good idea to do a post on packing for an extended weekend. I’ve learned over the years that packing light is always the way to go. Travel will feel less hectic and literally less heavy when you pare down what you’re bringing along. Packing less on your way to someplace also means more room for new things you might bring back. ;). 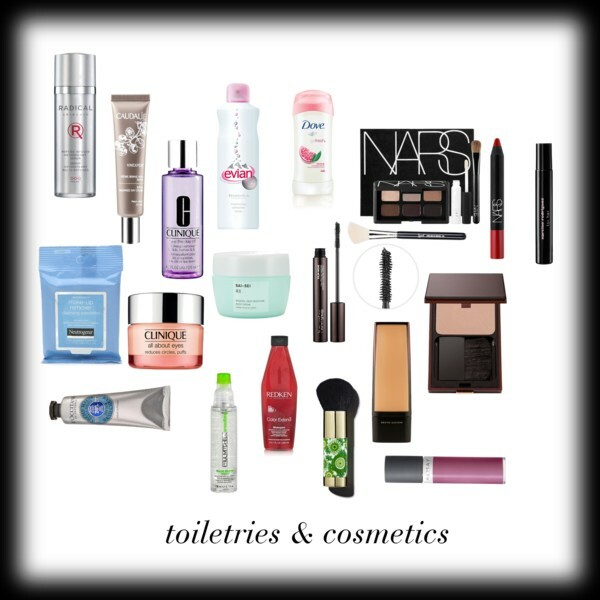 It looks like I went overboard on the toiletries & cosmetics, but looks can be deceiving. Everything you see is sample or travel sized except for the foundation, blush, lip products, and brushes, and even those were picked for their discreet size. The foundation has the slimmest packaging I’ve ever found for a foundation; the blush compact is thin as well. I chose the Sonia Kashuk kabuki brush for buffing because it’s quite short, and both lip products can fit in the palm of my hand and are low maintenance. All liquids will fit in the Sephora see-through TSA approved bag below, and all the rest of my makeup fits into one small/medium cosmetic bag. one| Pick a color palette for your outfits. I find this easy since most of my closet is neutrals that go well with each other, but if your closet has a lot more color variety (good for you! ), pick two or three shades of neutrals and pick pieces of clothing that are in those shades (e.g. blue & grey, black & camel). To keep things from getting too monotone, stick in a pop of color of your choice, be it through a blouse, a pair of shoes, or a scarf. two | Accessorize wisely. Jewelry and other accessories are a great way to infuse some personality and variety in a very basic travel wardrobe without adding too much bulk. That being said, be judicious in choosing what pieces you bring and how many. three | Bring the least amount of shoes possible. This piece of advice is an arrow to the heart of any shoe lover like me, but let’s face it, shoes are bulky. There’s no faster way to run out of space in a little suitcase than to start packing in pairs of shoes. I wear the bulkiest pair I want to bring, which is usually a pair of black boots that are either flat or with a low heel, and pack another pair or two max, depending on the activities planned. 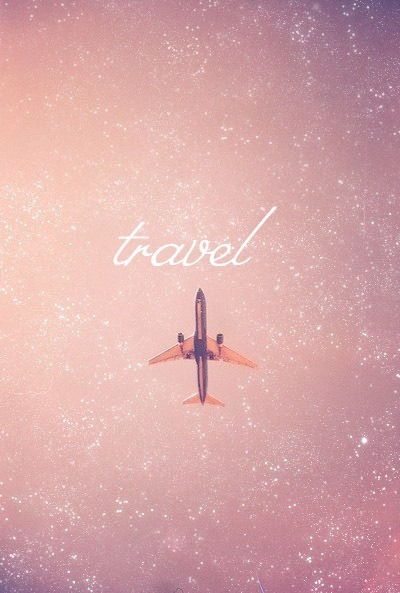 four | Have good traveling gear. We invested in a pair of spinner wheel carry-on size suitcases a year ago, and they’ve made flying that much easier. Our suitcases maneuver so much better on wheels that can spin 360 degrees. 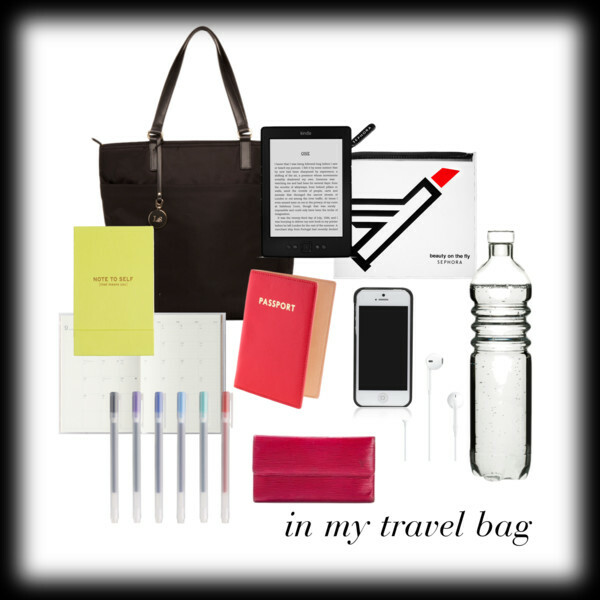 As my “plus one” carry on item, I always use a travel bag. My travel bag of choice is my Lo & Sons Travel Tote. I usually toss a little crossbody bag into my suitcase for use when I get to where I’m going, but this time around I’m bringing a Longchamp tote bag that’s foldable and lightweight. five | Dress well for the flight. Or train/bus/car ride, if that’s your method of travel. Dressing well means dressing appropriately, both comfort-wise and style-wise. Going on a plane is not the time to pull together your most glamourous outfit, but it’s also not the time to look like you just rolled out of bed. six | Hydrate & moisturize. Cabin air is so dry, and the air this time of year is harsh in general. Drink plenty of water and moisturize your hands and face. Once I’m pass security, I always buy a 1L bottle of water. It’s more cost-effective to get the bigger size anyway, plus you’ll have plenty of water on hand. * whenever possible, pictures in these collages represent the actual product I own, but in the event I can no longer find the item online, I choose another similar product instead. these similar products are denoted by an asterisk.